I’ve never been a huge fan of meatballs. Wait, no. That’s not exactly true. I do adore meatballs, only I really don’t care for the crazy amount of work that they demand from you only to offer so little gratification in return. I find that they’re a total mess to make, the process of rolling the balls simply takes forever, then they splatter all over the place when you pan-fry them and in the end, they go down way too easy so you can eat tons before you even get a sense of having eaten something “substantial”. At that rate, I’d much rather go for a thick, meaty, beefy, juicy patty and go at it like a boss, you know. BUT! 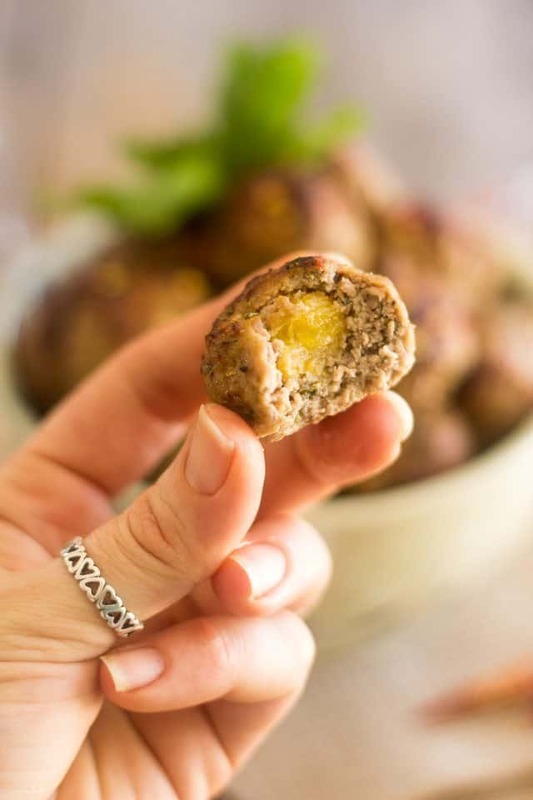 Every once in a while I seem to be getting an uncontrollable craving for meatballs and can’t help but treat myself to a few of these meaty bites of goodness. And if I’m gonna jump through all the loops that they require me to, I say I might as well take one extra step and add a nice little surprise it their center to turn them into something extraordinary! Remember my Creamy Avocado Stuffed Meatballs? Man were those ever good! This time, I chose to take a completely different route and go with pineapple. Oh! They were brilliant. 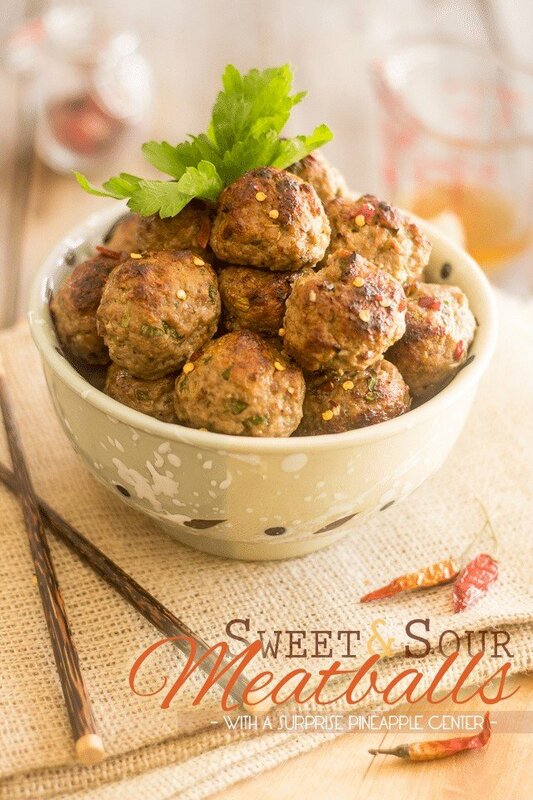 The balance between sweet and sour was just perfect and the addition of pineapple made the meatballs melt-in-your-mouth moist and tender. So this is a case where you don’t want to let your meat mixture rest. Just mix it and use it right away! 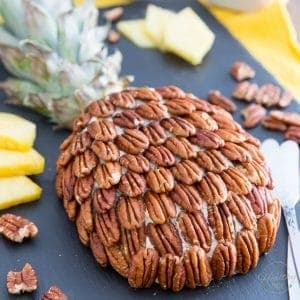 But before we get to that meat mixture, we need to get ourselves some cute little pineapple surprise centers ready. 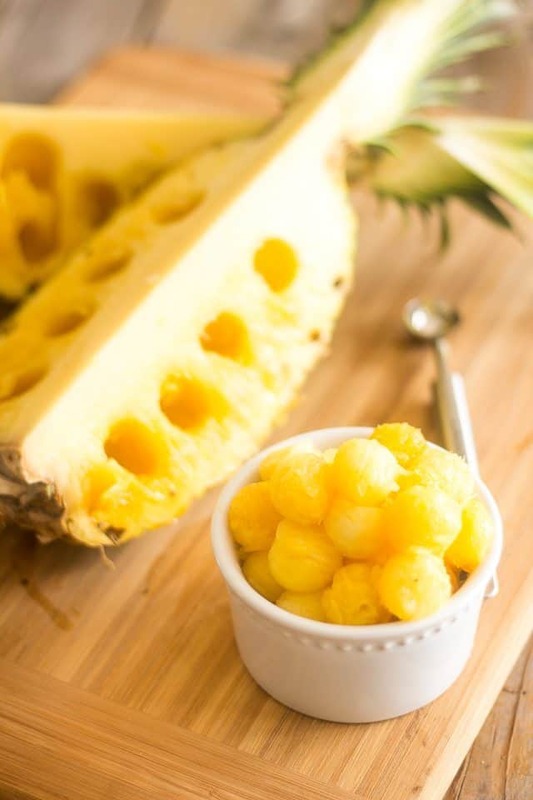 Cut the pineapple into quarters and, with the help of a melon baller, scoop out 36 little balls from its flesh. Set those aside. Now, we’re also going to need a quarter of a cup of crushed pineapple, so we might as well go ahead and take care of this now! 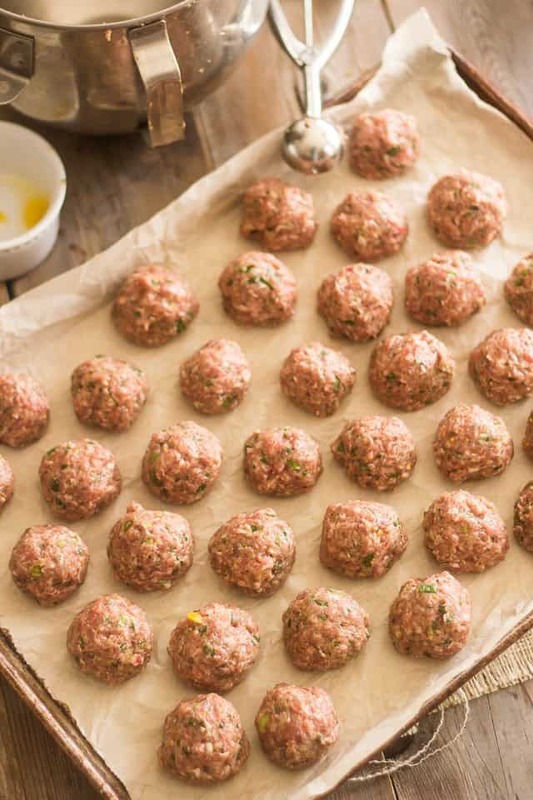 After you’re done making the balls, cut out some more of that flesh and reduce it to a puree in a small food processor or chop it real finely with a knife. Add all the ingredients for the meatballs to the bowl of your stand mixer if you have one. 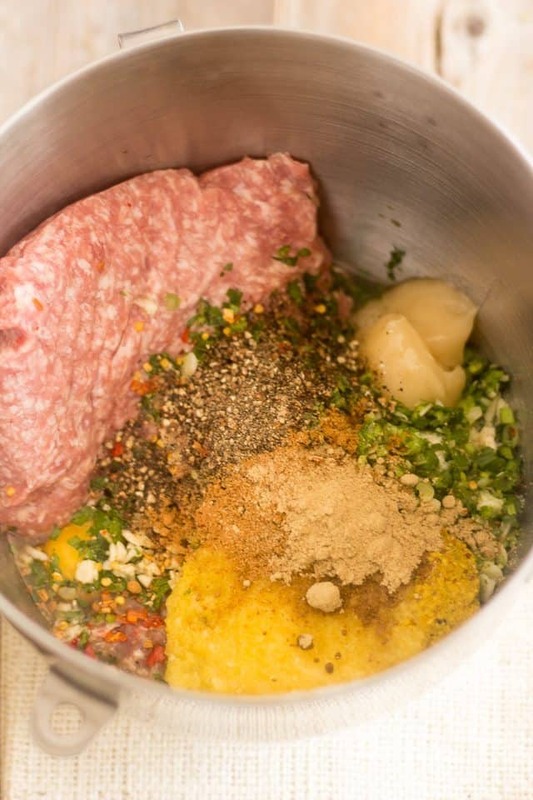 This will give your meat mixture a much smoother and finer texture. If you don’t have a stand mixer, though, you could very well mix this the good old fashioned way, i.e. with your bare hands. If using a stand mixer, combine the ingredients on medium speed with the paddle attachment until very well combined and slightly airy. 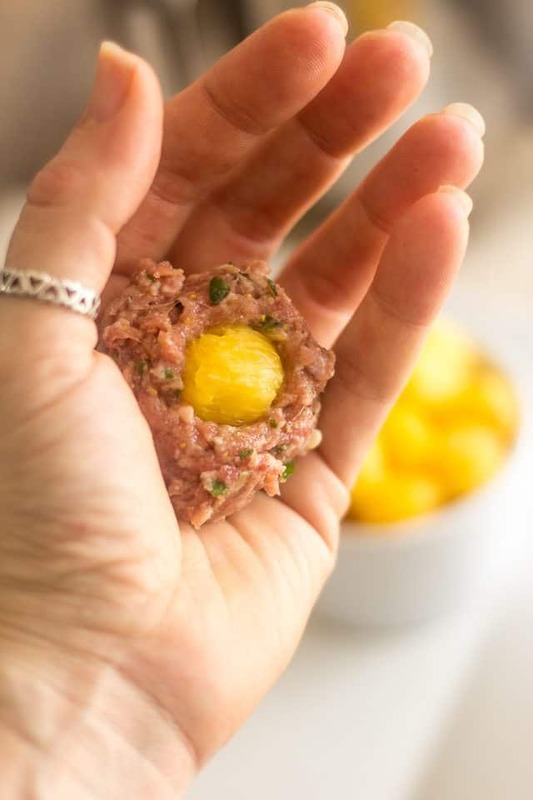 Scoop about a tablespoon of the meat mixture directly onto the palm of your hand (an ice cream scoop works wonders for this) and place a pineapple ball right in the center. Delicately work the meat around the pineapple to completely encase it and then form your meatball into a perfect sphere. 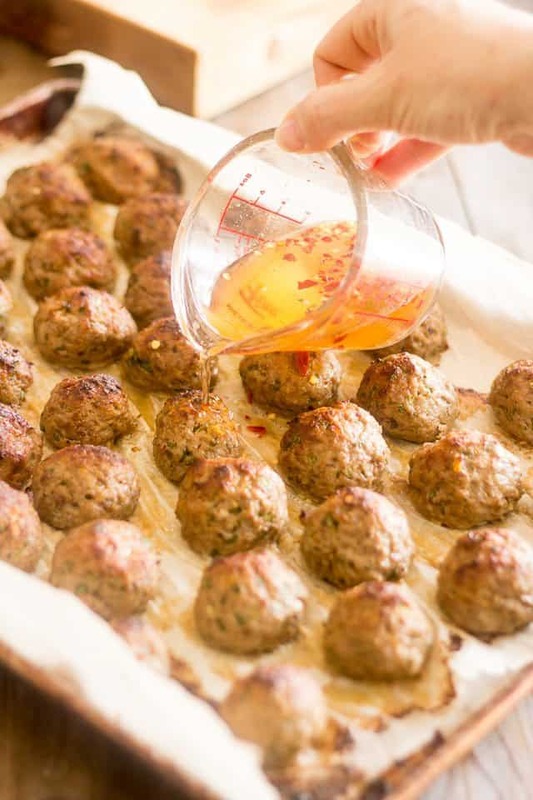 Place the finished meatballs onto a prepared baking sheet and bake in the oven until the meatballs are cooked through and crispy and golden brown all around. Honestly, while this technique might yield meatballs that are a bit flattened on one side, I must say that I am a huge fan of baking meatballs. 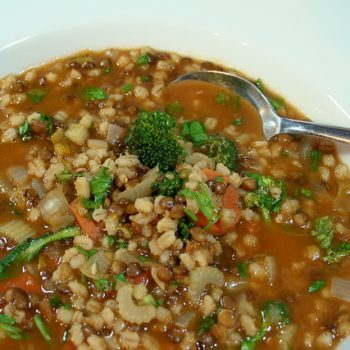 For starters, it can be done in a single batch, which is a MAJOR advantage, and secondly, NO SPLATTER!!! I’ll take a flat side (wait… can a sphere really have a side?) over fat splatter any day. When your meatballs are done baking, place all the ingredients for the sweet and sour sauce into a glass measuring cup and cook in the microwave on high for about a minute. Stir to combine and make sure that the honey is completely melted. You could also do this on the stove top if you’re not a fan of microwaves. Slowly pour a little bit of that sauce right over each meatball to infuse it with more sweet and sour deliciousness. 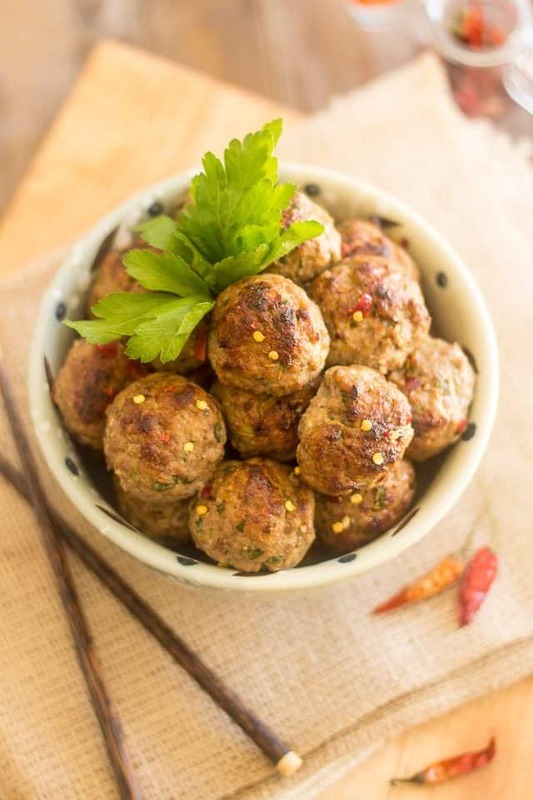 Transfer the finished meatballs to a serving dish and serve with the leftover sweet and sour sauce, if you managed to save any. In fact, if you’re a fan of dunking your meatballs into a dipping sauce, I strongly recommend that you make a double batch of that sauce, for it is quite tasty and does elevate these little meaty bites to a whole ‘nother level! 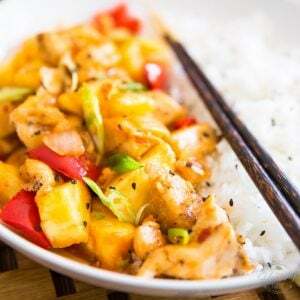 Can you ever get too much sweet and sour goodness? And let’s not forget the surprise pineapple center! 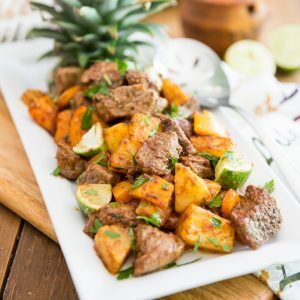 The beautiful rounded chunk of warm pineapple that’s hiding in there delivers a hit of juicy, sugary goodness to your taste buds with every bite and most definitely adds an element of interest to these scrumptious meaty treats..
Good thing we’re making 36! Cut the pineapple in quarters and, using a melon baller, scoop out 36 little balls from its flesh. Set aside. You will also need ¼ of a cup of crushed pineapple so after you're done making the balls, cut out some more of that flesh and reduce it to a puree with a small food processor or chop it real finely with a knife. 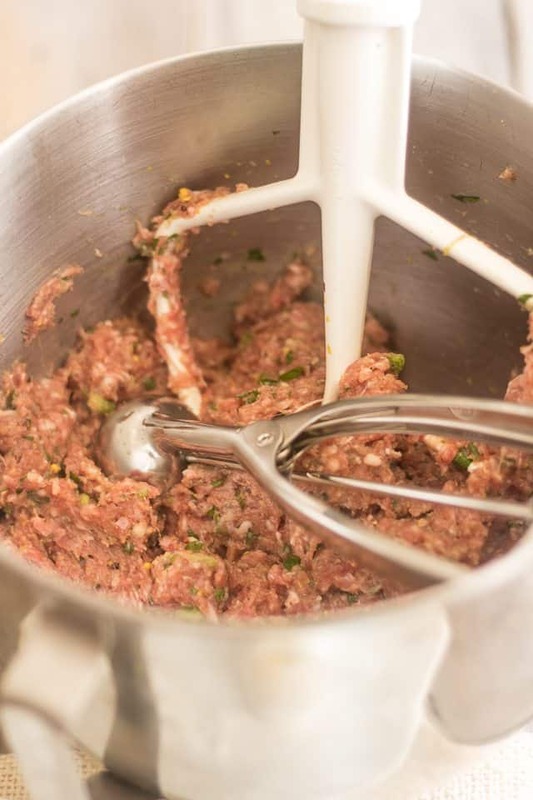 Add all the ingredients for the meatballs to the bowl of your stand mixer and mix on medium speed with the paddle attachment until very well combined and slightly airy. You could also use your hands if you preferred, although this would result in a coarser meat mixture. Scoop about a tablespoon of the meat mixture directly onto the palm of your hand (an ice cream scoop works wonders for that) and place a pineapple ball right in the center. Delicately work the meat around the pineapple to completely encase it and then form your meatball into a perfect sphere. 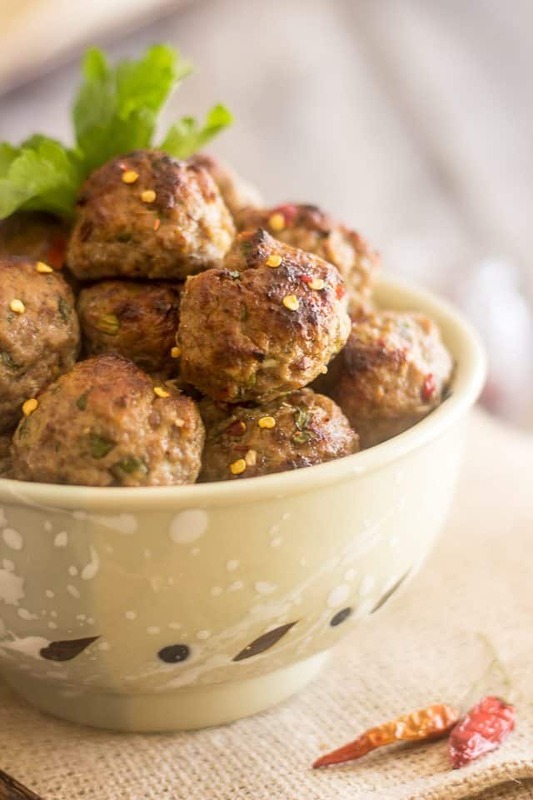 Place the finished meatballs onto the prepared baking sheet and bake in the oven for 10 minutes at 425F, then lower the temperature to 350F and continue cooking for about 10-15 minutes, until the meatballs are cooked through and crispy and golden brown all around. When the meatballs are done baking, place all the ingredients for the sweet and sour sauce into a glass measuring cup and cook in the microwave on high for about a minute. Stir to combine and make sure that the honey is completely melted. You could also do this on the stove top if you're not a fan of microwaves. Note that these meatballs are fairly delicate and will need to be handled with tender loving care. 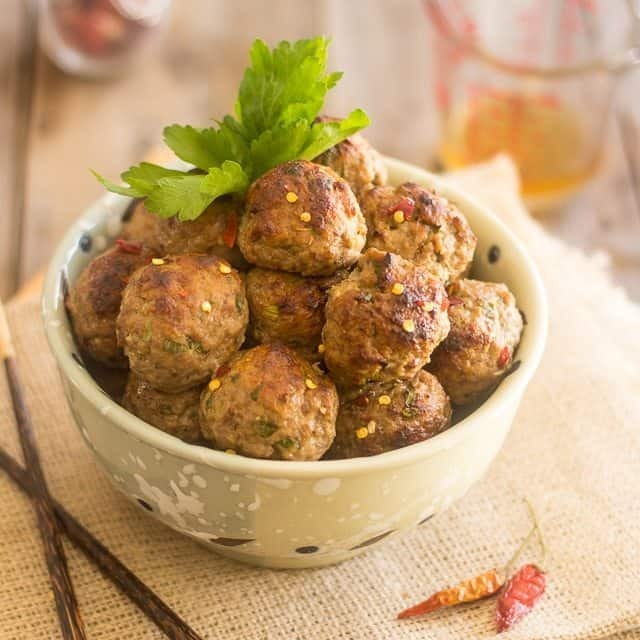 This sounds like a great summer alternative to classic meatballs… I can even imagine making larger ones and grilling them, or putting them on skewers with chunks of pineapple for a barbecue! Oh, I would not put them on skewers, Dani, they are way too delicate for that. I don’t even think that I would attempt grilling them. Pineapple really makes that meat super tender. If I was to grill them, I would definitely omit adding the crushed pineapple to the meat mixture. I love your avocado meatballs and I’m probably going to love even more these ones with pineapple (if that’s even possible!) 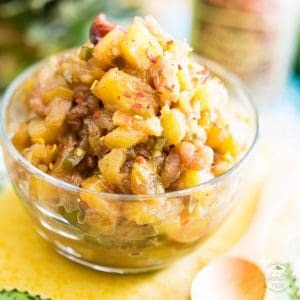 If for no other reason that I’m a sucker for sweet & sour. Oh btw I’m totally copying that sauce of yours, sounds genuinely legit! These look fantastic, can you make ahead? Serve hot, cold or both? 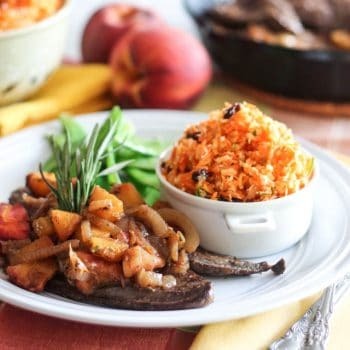 You can make ahead and reheat, or even eat them cold if you like cold meat (I know I do!) Or make some extra sauce, heat it up and serve the meatballs cold, then dunk them into the hot dipping sauce. The contrast between hot and cold would be awesome, me thinks! Omnom! And I just bought a pineapple! We use a mini muffin tin to cook out meatballs in… I can’t remember why, but Alton Brown recommends it for cooking meatballs. 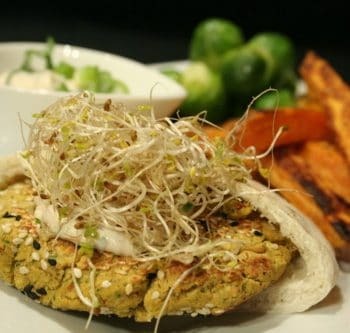 Hi can I substitute the coconut flour for whole wheat flour? Would it change the proportion? It’s hard for me to say without having tried it first… I don’t think I’ve ever used grain based flour in meatballs before. 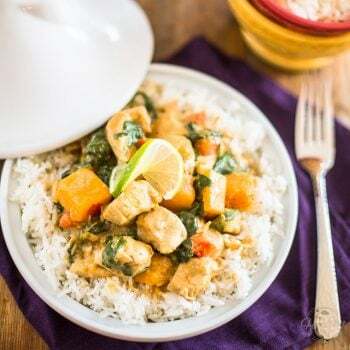 As a general rule of thumb, though, you’ll need one quarter to one third the original amount of coconut flour when subbing any other kind of flour. 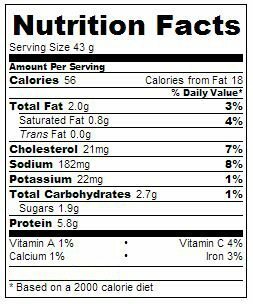 Note to others…read up on coconut flour and don’t just put same amount of regular flour…? Will these meatballs freeze well? Not sure, but I would definitely freeze them after they’d been cooked, if I was going to do it. Let me know how it works out if you end up trying it!